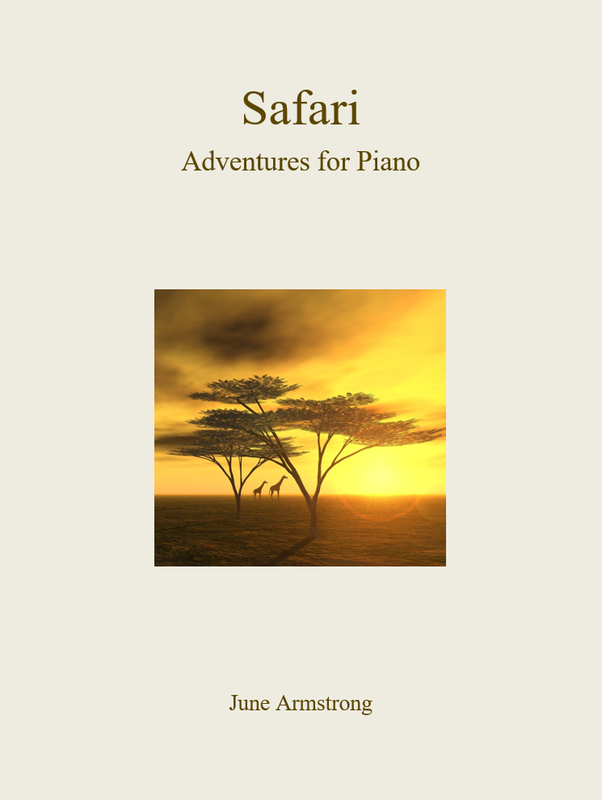 My competition this weekend features a new collection of beginner to pre-grade one piano pieces written by composer June Armstrong. Safari consists of 23 elementary pieces and follows the course of a day in Africa, starting with African Dawn and ending with Night Sky with Stars. You can meet all the animals along the way – gazelles, flamingos, lions, giraffes, hyenas, monkeys, elephants and many others, as well as a myriad of atmospheric scenes such as Mountain Mist and Mirage. To listen to every piece click here. This selection contains a distinctly appealing atmospheric sound, and one which I think both adult and child beginners will enjoy. A wide range of piano techniques are introduced, and therefore these little pieces form excellent teaching material. I have two signed copies of this volume to give away, so please leave your comments in the comment box at the end of this post, and I will select two winners (and announce them on this blog, so stay tuned!) on Sunday evening (British time). If you would like to purchase Safari, you can do so here. Yes please! I’ve heard very good things about this already and like her other work very much so would love to win a copy 😉 Thank you for the opportunity! An excellent book, purchased for a transfer stundent as a birthday present from parents. He is very happy with it. Would like to have it myself! This would be fab to add to my growing collection of June Armstrong! Would like to win this composition. I love this book, and I have a student whose parent is reluctant to spend any money on books at all, but I would love her to have it so I can teach her the wonderful pieces. I would love to be able to share this amazing collection with one of my students. Listened on you tube and loved the simplicity despite producing a satisfying sound. Have heard such great things about this collection – would love to give it a go! Thanks so much for the many opportiunities you provide, Melanie! And June Armstrong is such an imaginative and creative musician…I so hope to win, but will be very pleased for anyone who is chosen! I bought Armstrong other collection Paint Box and my students love the sound of the pieces. Safari is on my wish list . Just finished listen to it, it is beautiful! I love the animal theme, but more than that, I’m really impressed with how simple yet atmospheric each piece is! It’s also nice for the parents/teacher that the demo videos state what technique each piece focuses on. This is definitely on my wish list for the little ones who are starting piano. I sure would have been excited to bring all these animals of the African safari to life myself when I was just beginning! I just recently discovered June Armstrong, and love what I’ve heard of her music! I never win anything, but am entering anyway…. I’ve heard lots of rave reviews about this collection and would love to own a copy! Teaching through pupils’ imagination has to be the way forward and these pieces certainly appeal in that way. This is yet another one of those books that I keep meaning to buy! Love using Toy Box with my pupils and know they would live a book of animal themed pieces. I have been wanting to add June’s composition to my library so crossing my fingers !! I have been wanting to add June’s composition for a while so hope I get the chance to win 🙂 Ty ! June Armstrong’s collections are wonderful for encouraging pupils to use imagery and creative language to enhance their playing – I’d love to win this one! I would love to add Safari to my collection. I use Paint Box all the time with my pupils, both adults and children, and it always inspires and delights them. These pieces would make an interesting recital theme for my students. Lovely! I was intrigued by the evocative nature of these pieces and would love to explore them further. Sounds like a wonderful book! I hope I win!